Glacier: The glaciers that give this Montana park its name are retreating in the face of global warming, but visitors will still enjoy cool mountain temperatures ranging from the mid-40s to the high-70s in the summer. August in particular is a nice time to visit since the normally soggy park gets the least amount of average rainfall during this month. Olympic: With its coastal rain forests and moderating marine climate, Olympic National Park tends to be drier in the summer, with air temperatures rising only as high as 65-75 degrees during the day. Visitors to Olympic can take refreshing hikes anywhere from high mountain peaks to cool, green valleys and along the wild Washington coastline. 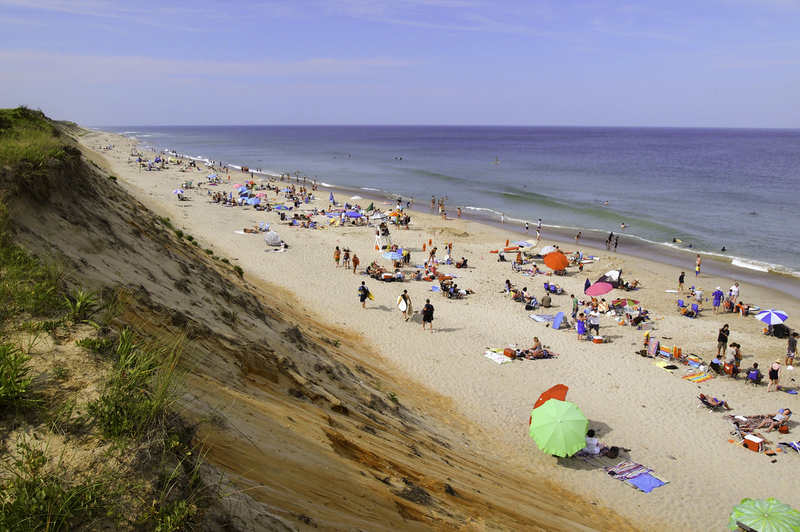 Cape Cod: Beating the heat by heading to the beach is a time-honored tradition, and you won’t find better beaches anywhere else than on Cape Cod. The Cape Cod National Seashore includes 40 miles of beaches, and since the Cape stretches 60 miles out into the Atlantic, steady breezes and cool waters are nearly guaranteed. Acadia: Located in coastal Maine, Acadia National Park can occasional get into the 90s during the summer, but the ocean temperatures hover in the 50-60 degree range, meaning you can always take a quick, brisk plunge to cool off on even the hottest day (or take a dip in one of the park’s lakes, which tend to be a few degrees warmer). Denali: Hiking in Alaska’s Denali National Park during the summer not only means a near-guarantee of seeing grizzly bears, caribou and wolves (park wildlife are in a frenzy to take advantage of the brief bounty of summer), but you’ll enjoy daily temperatures ranging from 33 to 75 degrees even on the lower-altitude tundra. Carlsbad Caverns: Despite it’s location in New Mexico’s Chihuahuan Desert, the temperature within this famous cave system is a constant 56 degrees Fahrenheit. Tours take between 1.5 and 5.5 hours, so it’s possible to cool off underground for most of the day here. Crater Lake: Warm, dry days (with maximum air temps around 68 degrees) and cool nights are typical summer weather at Crater Lake National Park, where you can swim in the 1,943-foot-deep lake — the deepest in the U.S. — that gives the park its name. Summer lake temperatures range from 50-60 degrees, so most people who hike down the Fleetwood Cove Trail to the lakeshore tend to take a quick plunge, not an extended swim. Isle Royale: Located on an isolated island in Lake Superior, Isle Royale National Park has hundreds of miles of hiking trails and untouched wilderness to explore, and it’s sometimes foggy offshore location and northern location means the mercury almost never tops 80 here. Mt. Rainier: Mt. Rainier towers 14,410 feet over the Washington landscape, and the higher you go in elevation, the cooler it gets. Not to mention that this mighty dormant volcano is covered with glaciers, and that snow remains at high elevation year round (even at the 5,000-8,000 foot level, where many park visitors spend their time, snow can linger into July). Summer highs tend to top out in the 60s and 70s.